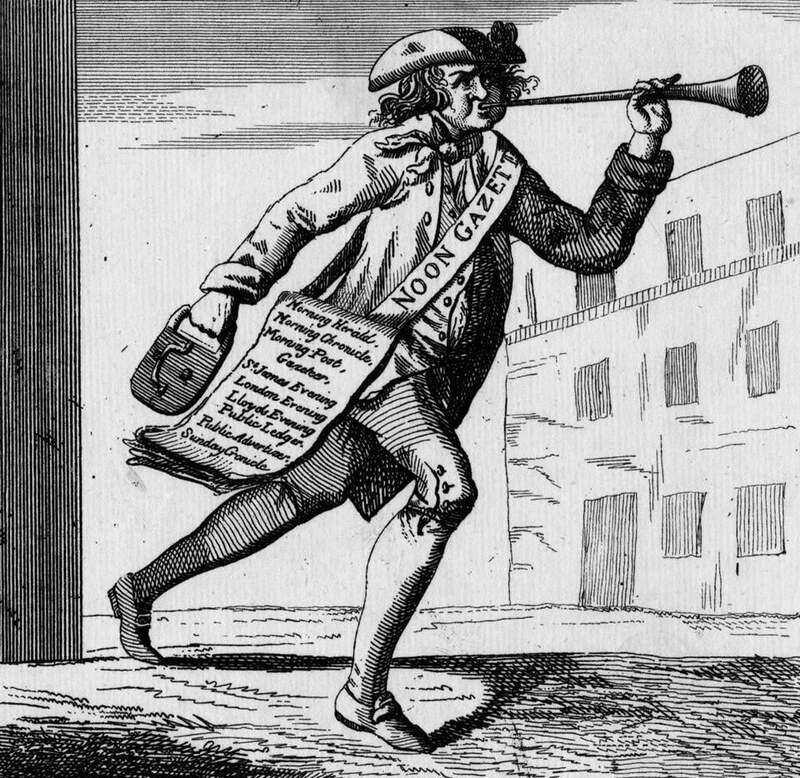 A cartoon, circa 1780, captioned “An Englishman’s delight or news of all sorts,” listing 10 different papers. For almost 25 years, newspapers have been shedding jobs and closing up shop. A 2012 study by the Annenberg School at the University of Southern California predicted that most medium-circulation US newspapers would be history within five years. While readers who have already moved over to digital news may not notice, watchdog groups and media critics worry about diminishing coverage of both local and international affairs, and what it means to abandon the comprehensive presentation of the day’s news in one authoritative package. It can sometimes seem like what’s under threat is the standard model for how we find out what’s happening. 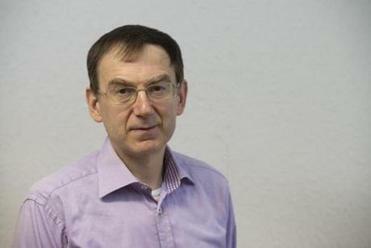 But historian Andrew Pettegree of the University of St. Andrews in Scotland has written a new history of news that puts the dominance of newspapers in context. In fact, he says, the golden age when the newspaper was seen as the central and undisputed source for news actually occupied a fairly short 150-year window, from the late 18th century up to the advent of radio and television. The Boston News-Letter, from April 1704. In “The Invention of News: How the World Came to Know About Itself” (Yale University Press), Pettegree shows how Europeans in the 15th through 19th centuries got news from a cacophony of sources: their friends and neighbors, government edicts, songs sung by itinerant performers, sermons, letters, and expensive manuscript newsletters. Even after newspapers became available, they weren’t universally embraced. It took technological change, urbanization, and a few big political events to cement the daily newspaper at the center of the news ecology. Pettegree spoke to Ideas from his office in St. Andrews. This interview has been edited and condensed. IDEAS: The first newspaper was printed in Germany in 1605, but you describe at least two centuries of news circulation before that time. How did Europeans get their news in the 15th and 16th centuries? PETTEGREE: Print took a little time to take off, because so many people got all of the news for free. They got it through conversation in the market square. They got it through public announcement. They got it through sermons in church. And they got it through media we scarcely consider these days, like singing. IDEAS: In middle of the 16th century, printers started to sell broadsides—one-off pamphlets related to colorful news like earthquakes, battles, comets, and awful crimes. Why were those so popular? IDEAS: At the same time, you say, merchants and politicians were paying for news that was more useful. PETTEGREE: The first news agencies were found in Venice and Rome, and they were intended to provide dry facts to people who could interpret the news for themselves....[These newsletters] were very expensive...a subscription for an annual newsletter was the same as a salary for some people in very high-up positions. IDEAS: Why was the newspaper printed in 1605 in Germany considered a “newspaper,” as opposed to these newsletters for elites? PETTEGREE: It was a serial, so it was regularly produced. It was produced frequently, not like a yearbook, sold once a year. And it was sold commercially....It has an extremely terse style of reporting, an absence of order in the stories. They were simply printed as they came in, so the most important news story might be buried deep on page 3. There is no illustration, no headlines, no comment. So there’s nothing to assist the reader....For many of the people who might have been tempted to sign up for a subscription to the first newspaper, this would have been disappointing, baffling, confusing, dull. IDEAS: During the two centuries between the invention of the newspaper and its dominance in the early 19th century, what would a newspaper have looked like? PETTEGREE: Most newspapers were produced in communities which have only one newspaper....Most had this very old-fashioned model of mostly talking about foreign politics, very little domestic politics, because being the monopoly provider in a market like Stuttgart or Boston, they were trying not to offend any of their readers by taking sides in local controversies....The exceptions to that are few and far between. Places like London, which was a booming city with many hundreds of thousands of inhabitants, could sustain more than one newspaper. IDEAS: If people weren’t generally subscribing to and reading the newspapers in the 17th and 18th centuries, where were they getting their news? IDEAS: By the 19th century, newspapers did become the way to get news. What changed? PETTEGREE: Greater urbanization, as it’s really the towns that created a critical mass of readership for printed news, whether it’s pamphlets or newspapers....A large number of people gathered in one place who would buy. And also transportation. 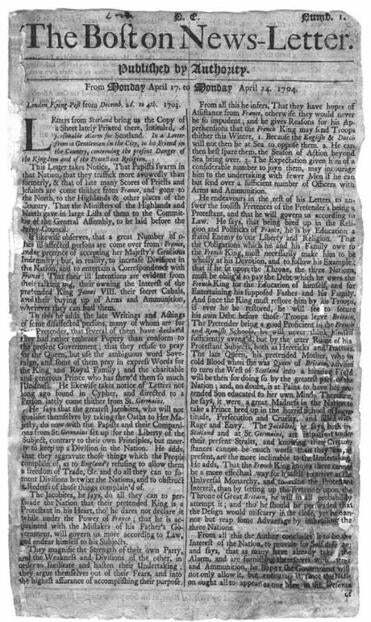 Because even in a place like Boston, it was very important that you could get the newspaper out to the villages around in a reasonable time....Then, of course, great events did matter....The great thing about the French Revolution, and the American Revolution, and the English campaign for parliamentary reform, is that they were very long-running news events. IDEAS: And all-consuming events that affected people’s lives. PETTEGREE: Exactly so....The French Revolution was a matter of life and death....Likewise, in the American Revolution, it was very important to know the disposition of the armies and whether your particular habitation was likely to be in a war zone. IDEAS: How does it change our perspective on today’s news environment to know that the newspaper period was shorter than we thought? PETTEGREE: One lesson of the media change that I describe, from manuscript to print, is that it was always accompanied by a whole lot of false prophecy. People said: Print will kill the manuscript. As we know, manuscripts remained an essential part of 16th-, 17th-, 18th-century society....And these prophecies of the future are often made by people who have a lot of money bound up in the prophecies being true. I think you can see the same thing in the shift from print to digital today....Where [producers] see absolute change that will make the old world redundant, consumers are quite canny. They want the best of both worlds. They use digital, but they continue to use print. They just use them for different things. 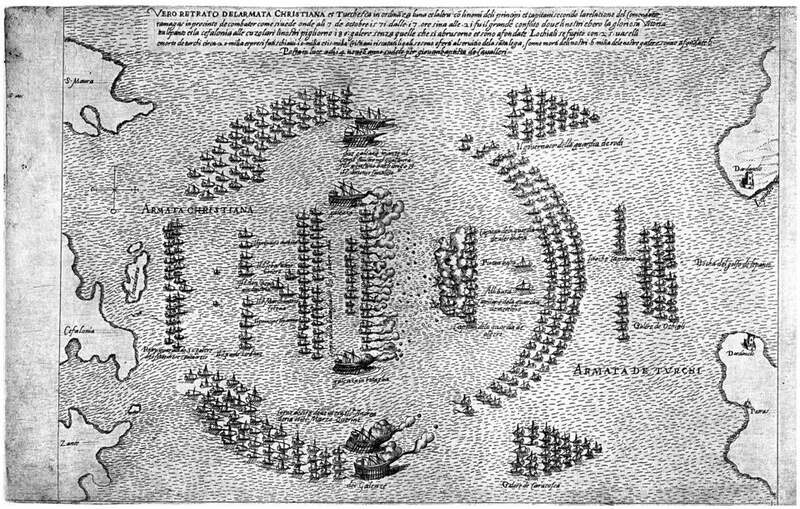 Engraved Italian depiction of fleets at Lepanto (c. 1571). Rebecca Onion is a writer and historian living in Philadelphia. She runs Slate’s history blog, The Vault.